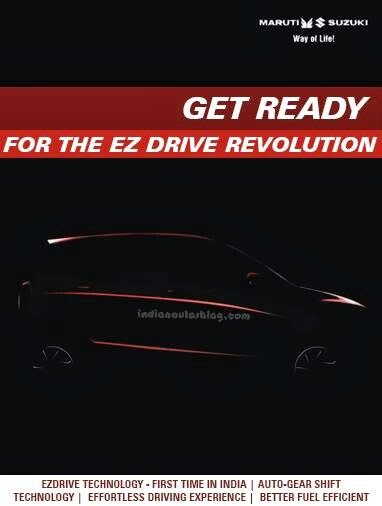 Maruti Suzuki's upcoming YL7 which we confirmed last week that would be called as Celerio. The first ever teasers have been released by the Japanese carmaker and the car would be displayed at 2014 Auto Expo. The new car would replace the Alto (and Celerio in some countries) globally and A-Star and Estilo in India. The Japanese carmaker also announced that Celerio would get an Automated Manual Transmission (AMT) and would be called as EZ Drive.An AMT would provide a clutchless drive to the passengers like an automatic transmission. However, as per Maruti Suzuki the benefits of AMT is its more fuel efficient gearbox which the company claims to be 5 percent more fuel efficient and also much cheaper than the conventional automatic transmissions available in India. The Celerio would be powered by 1.0L K10 engine which would be currently available only in Petrol fuel. The company also plans to introduce a Diesel version of the same in year 2015, however no official confirmation is done by the carmaker as of now. The engine will be available with a power output of 68PS and 90PS of torque. Stay tuned for more information during the launch from 2014 Auto Expo.